Silence of dawn is shredded by the coooo ooooo of the cuckoo. The spotted female joins in by her “kik kik kik and the duo fly away chasing each other. We are at the thresh hold of summers or already into it. A large number of bees lie dead in pathways. My daughter collects them in a leaf and wonders if they have completed their life cycle. She is aghast to learn that the culprit is the medicine- the better name for pesticide spray being used in the mango orchards. How will we have fruits and veggies in our plants if we exterminate the very agents of pollination? Charles Darwin once said that “The life of man would be made extremely difficult if the bee disappeared.” Bees are responsible for pollinating 70 per cent of the world’s horticulture and agricultural crops, so without them we simply would not have fresh fruit and vegetables — in fact, we would all starve within five years, because nothing could be pollinated. We need to ponder over that. Some traffic here...in our bird bath. April also marks the beginning of new session in the schools. Having been homeschooled for the last two years, my daughter is all excited to join the school. When I think of her lunch box, I remember my school days. We used to be so excited about lunch time. If our box had goodies, that seemed to be the sole motive of going to school and that, would be the “best day” irrespective of other activities. Simple jam bread would be such a treat sometimes, breaking the monotony of everyday lunch of chapatti with veggie. And when it comes to Jams, it feels nice and happy to have a variety of them in the pantry. I am always eager to add a new bottle of jam to my existing ones. 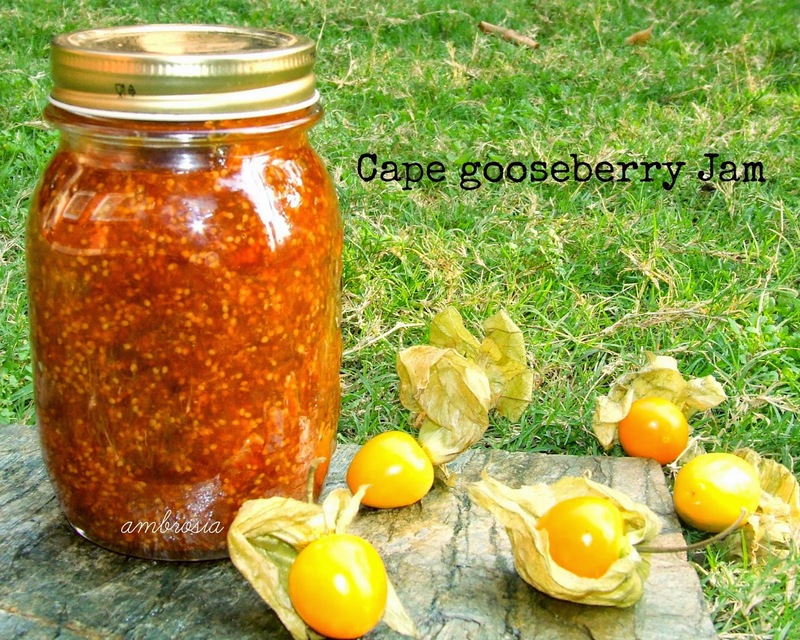 Having made Guava Jelly and Black Grape Jam, I wanted to make jam from Cape gooseberries. The seeds in the fruit add a lovely crunch to the jam. We bought half kg of Cape gooseberries to make jam. Remove the outer husk from the berries. Wash them. Put them in pressure cooker with water just enough to cover them. Turn off the heat after the first whistle. Transfer the cooked fruit in a thick bottom steel wok. Add sugar. Mash the fruits with a ladle against the sides of the wok. Add lemon juice. Cook on high flame stirring constantly till it come to a rolling boil. Reduce the heat and cook till it becomes thick and attains jam like consistency. This is delicious and absolutely yumm..
Jam looks delicious. Your bird pictures are awesome too :) Totally agree about pollinators-it's a serious issue worldwide- bees etc. have to contend with GM crops, pesticides and a new deadly virus. The situation is grave. We are thinking of building a home for wild bees at the bottom of our garden just to try and do our bit to help them. Omg, this jam is just fantastic, by the way its really fun to watch birds na. Namita, whenever I see home made jams I feel like making one but the thought of who'll eat all that holds my hand....kiddoos love their bread with butter.....i'm sure i'll like the texture/crunch in this jam. And talking about packed lunch....I feel that's the best way to be creative for moms. Hello, I have used the regular white sugar in this Jam. Personally I have never used sugar free pills in the jam. But I have a site for you. This is all about making sugar free jams. Hope this helps. Good wishes!